Steven Pacey has narrated several books in the Penguin Classics series. These are vintage recordings, released from the Penguin archive for digital download. 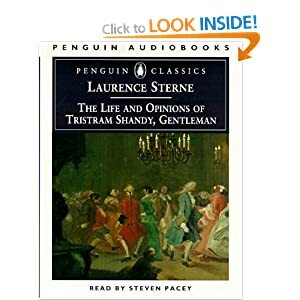 This recording, originally from 1998, is of Laurence Stern’s classic, Tristram Shandy: Life and Opinions of Tristram Shandy, Gentleman. Laurence Sterne (24 November 1713 – 18 March 1768) was an Anglo-Irish novelist and an Anglican clergyman. He is best known for his novels The Life and Opinions of Tristram Shandy, Gentleman, and A Sentimental Journey Through France and Italy. Laurence Sterne’s great masterpiece of bawdy humour and rich satire defies any attempt to categorize it. Part novel, part digression, its gloriously disordered narrative interweaves the birth and life of the unfortunate “hero” Tristram Shandy, the eccentric philosophy of his father Walter, the amours and military obsessions of Uncle Toby, and a host of other characters, including Dr Slop, Corporal Trim and the parson Yorick. 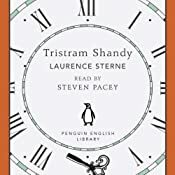 A joyful celebration of the endless possibilities of the art of fiction, Tristram Shandy is also a wry demonstration of its limitations.